California’s coast redwoods follow the fog and thrive at elevations below 2,000 feet, where heavy winter rains and moderate year-round temperatures occur. Trees can grow to 350 feet or more, with a base diameter of about 20 feet. Their root systems are broad and shallow, from only a few inches to 6 feet underground. They resist insects, fire, and rot. Their vigor in sprouting back when cut or badly burned is an important factor in their longevity. The oldest known tree has been around for more than 2,500 years. Feathery ferns, redwood sorrel, salal, trillium, Douglas iris, and tiger lily grow in splendor beneath redwoods. Salmonberry, thimbleberry, and huckleberry provide wildlife forage, and acres of rhododendrons and azaleas bloom from April to June. The area’s warm climate encourages many other tree species—including western hemlock, Douglas-fir, big-leaf maple, red alder, California laurel, tanoak, madrone and Port Orford cedar—to share the redwood habitat. Deer, gray and Douglas squirrels, raccoons, and redwood chipmunks are common park mammals. Bears and mountain lions are sometimes seen. A rare treat is the sight of an otter playing in the river or a beaver working in a deep pool. The noisy Steller’s jay steals food from picnic tables and eggs from other birds' nests. Other local birds include American dippers, varied thrushes, and several species of woodpecker, with an occasional ruffed grouse, belted kingfisher, osprey, spotted owl, or marbled murrelet. 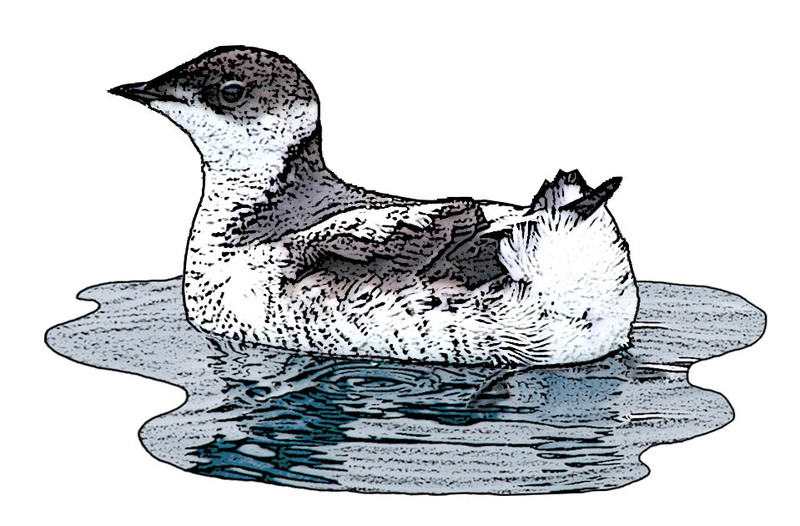 The marbled murrelet (Brachyramphus marmoratus) is known for its long commute. After spending the day fishing at sea, this chunky little auk returns, sometimes many miles inland, to nest in old-growth forests. Murrelets once numbered 60,000 along the California coast. Today, less than 6,000 remain. You can learn how to safeguard their remaining habitat by watching the "Crumb Clean" video on the park's home page. 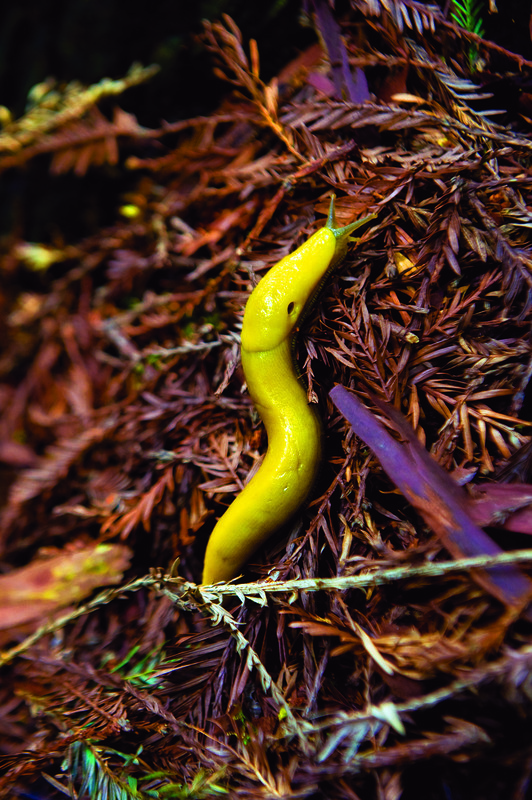 See more from our partners at the National Park Service about banana slugs and other invertebrates in coast redwood forests. Click here. Scientists studying the effects of rising global temperatures in Jed Smith and other redwood parks have found that the size and longevity of these trees helps them store more climate-altering carbon dioxide than other plants. Even old redwoods continue to grow, each year adding more carbon-filled wood than smaller, younger trees. After redwoods die, their rot-resistant wood holds onto that carbon for a long time. Redwoods cannot solve our climate problems all by themselves, but protecting redwoods and other forests is part of the climate-change solution. Unlike the parkland around it, upper Mill Creek was logged for 100 years. In 2002, with the help of Save the Redwoods League and other funding partners, the state acquired 25,000 acres of this ravaged watershed, just upstream from Jedediah Smith Redwoods State Park. Today State Parks and the League are restoring that land. Both salmon and downstream redwoods should benefit, including spectacular Stout Grove. Read about it here or watch a video. For more information about nature and science in Redwood National and State Parks, go to the National Park Service website.